Andrew had aspirations of being a dentist from aged 12 and qualified in 2005 from Cardiff Dental school achieving a Merit for clinical and academic achievement. These aspirations gave him the drive and motivation to own and establish the caring family practice of which he is now Principal, Wadebridge Dental. A profession he has a great passion and enthusiasm for and still enjoys greatly to this day. 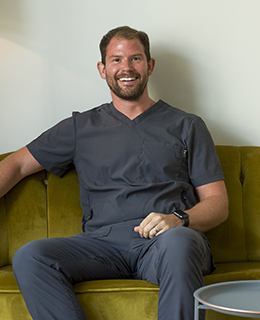 From the outset Andrew has aimed for the highest standard of clinical dentistry with an obsession for detail and keeping the client central to their pain free care. This is a quality he instills in all members of the team and is deeply routed in the practice values and ethos. These values of excellence and patient care were instilled in Andrew during his apprenticeship year at the practice in 2005 by the previous owner and his trainer for the year John Rickard. It was a natural progression to ownership of the practice to continue and develop John’s legacy created from the early 70’s to his retirement in 2007. The practice prides itself in a long and established history providing care for whole families and in some cases 5 generations of the same family. Andrew has created a strong bond with his patients. In his 14 years in practice Andrew has developed an interest in Cosmetic and Advanced Treatment including Dental Implants, Teeth Straightening (Invisalign, Six month smiles, Fastbraces, Inman Aligner), Teeth Whitening, Veneers, Root Canal Treatments, Crown and Bridgework, Sedation, Facial Aesthetics as well as General Dentistry to give you the best smile and put you at ease. Andrew has completed advanced training in Dental Implants at the International Team for Implantology. Straumann are one of the best regarded dental implant providers in the world and the brand Andrew uses at the practice. He is also a member of the Association of Dental Implantology. Andrew began a Masters Degree in Restorative Dentistry in January 2018 and continuing comprehensive postgraduate training keeps him up to date with the latest thinking, treatments and technology to provide for his patients. He is also a Foundation Dentist Trainer passing on his extensive knowledge, skills and experience to developing newly qualified dentists. In 2009 Andrew was elected as Chairman of the Local Dental Committee for Cornwall and Isles of Scilly allowing him to influence dentistry and represent, guide and help local dentists in Cornwall. Also representing the south-west region nationally on the GDPC-LDC liaison group which meets quarterly at the British Dental Association and in his involvement with the Local Professional network in Cornwall. Outside dentistry, Andrew moved to Cornwall in 2005 and set up home with his wife Melissa who qualified as a dentist in the same year and now also works at the practice. In his spare time he enjoys keeping fit, watching rugby union / formula 1 and time spent with his wife and their cocker spaniel Henry on long walks – soaking up the Cornish sunshine.